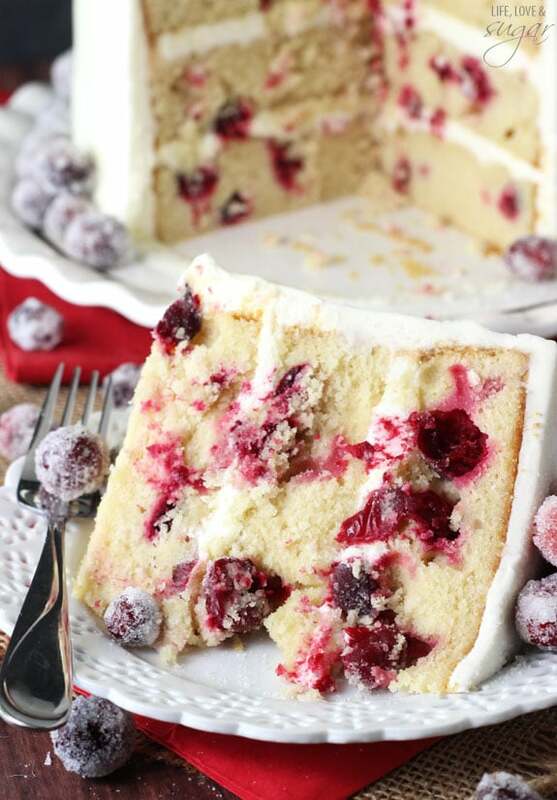 This Sparkling Cranberry White Chocolate Cake recipe is no doubt a new favorite – especially for Christmas! The cake is incredibly moist and flavorful and the cranberries add the prefect burst of fruity flavor. This weekend was crazy busy, but so fun! We finally started turning our “formal living room” into my office. We’d already cleared the room, so this weekend we steam cleaned the carpets and got the main pieces of furniture. I still want to get a few other things and some decorative pieces, but the big stuff is there and I’m ready to get organized! We got the furniture at IKEA and I love it! It took us forever to get through the store though. I got three pieces of furniture – a desk, shelves for all my props, and a table to use for taking photos on. It took awhile to pick everything out since IKEA has all these things in different rooms. I was taking a lot of pictures and trying to picture them all in a room together. The hubs didn’t really realize IKEA was so big and had so much stuff, so he was pretty excited to realize they had so many decorative things and stuff beyond just furniture. I think we’ll be making another trip soon. If you’ve been before, you know you collect the boxes at the end of the trek through the store. One of our items – the table – was back where only IKEA employees could get to it so after we checked out, we had to wait at the pick up area for it. It took longer than we expected though, so the hubs started wondering around near the food. Next thing I knew, he came back with ICEEs and cinnamon rolls. ICEEs are one of his all-time faves. “The cinnamon rolls had just come out of the oven and were only $1,” he said. Oh, how well he knows me. Besides, it’d been so long it was dinner time and we were hungry. Those cinnamon rolls didn’t last 30 seconds. And they were good too. So fluffy! The cake itself is a little modification of my vanilla cupcakes, doubled. Dang is it good. It is so moist and the flavor is to die for. I love that it’s one bowl and everything just gets mixed together. One note about the mixing – you don’t want to over mix the batter. Once everything is combined, you only want to mix until it’s smooth. No longer. The cranberries get stirred in after the mixing. This was my first time ever baking, or even tasting, fresh cranberries. I didn’t realize they were so tart! But baked into the lightly dense cake, they are sweeter and delicious! I love the pop of fruit in the cake. The icing is full of white chocolate. It’s made basically by making white chocolate ganache, then adding butter and powdered sugar. Delicious. And I was totally in love with the sparkling cranberries. They are just so festive! Because of them though, the cake takes a little planning. The cranberries sit in a simple syrup overnight so they get nice and sticky. Then they’re covered in sugar. I waited until the cake was all made and iced before moving onto the cranberries and that was silly of me. It was whole other day before I could finish off the cake with the cranberries and dig in. I used some of the remaining sugar that had clumped together on top of the cake. It felt so snowy and wintery. This Sparkling Cranberry White Chocolate Cake was a hit with everyone! I’m so glad too, because I needed help eating it. I knew if I didn’t get it out of the house soon enough, I’d devour the whole thing. Yummy! 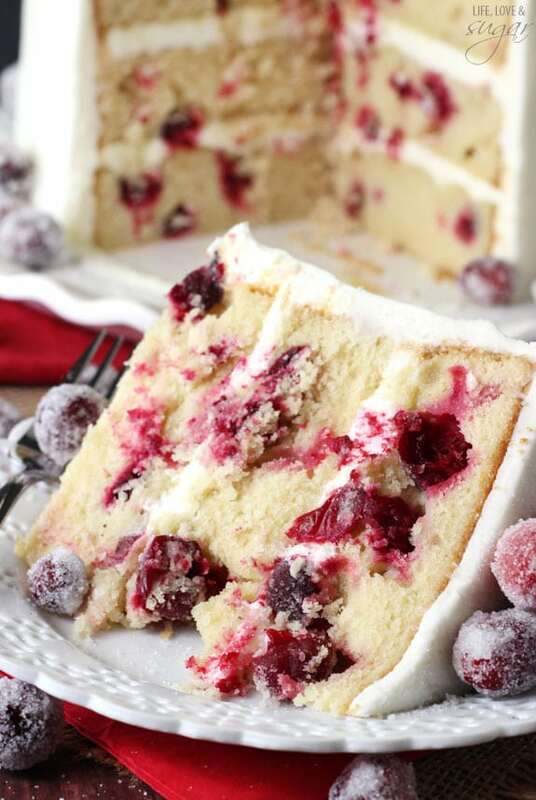 This Sparkling Cranberry White Chocolate Cake recipe is a new Christmas fav! 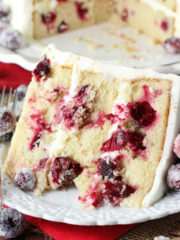 The cake is incredibly moist & flavorful with colorful sparkling cranberries. 4. Refrigerate cranberries in syrup overnight, stirred a couple times to coat with syrup. 5. Remove cranberries from syrup and roll in remaining 1/2 cup of sugar. You’ll need to roll them a few times to get a couple layers of sugar on them. 6. Set cranberries aside to dry for a hour or so. 1. Preheat oven to 350 degrees. Prepare three 8 inch cake pans with baking spray and parchment paper in the bottom of the pans. 4. Gently stir in cranberries. 5. Spread batter evenly between the three cake pan. 6. Bake 35-40 minutes, until a toothpick inserted comes out with a few crumbs. 7. Allow to cool for about 10 minutes, then remove to cooling rack to finish cooling. 2. Microwave heavy cream until it starts to boil. Remove from microwave and pour over chocolate chips. 5. Allow ganache to sit until mostly cool. It should be thick. 6. Beat the ganache with a mixer for about 2-3 minutes, until smooth and fluffy. 7. Add butter and beat until it is fully combined. 8. Slowly add powdered sugar and beat until it is fluffy and the right consistency. Add more cream if needed. 1. Remove cake domes from cakes with a large serrated knife. 2. Place first layer of cake on cake plate. Spread about icing on top in an even layer. 3. Add second layer of cake and add more icing on top in an even layer. 4. Add final layer of cake on top and ice the outside of the cake. 5. Top the cake with sparkling cranberries and add some around the edge, if desired. I think most cakes are best if they are allowed to settle for at least 12-24 hours after icing. It allows to flavors to settle. This cake will stay moist for several days after being iced. I’m making this as I type – two things – I can’t get the cranberries “that” frosty so I’m assuming I just have to use more sugar, but 2nd, I tasted one and well, are they just for decoration because even with all that sugar and soaking overnight, they are still very very tart..?? Yes, just add more sugar to get them frosty-er. And yes, they are pretty tart. After they sit for a day or so, they sweeten. But honestly, my small group ate an entire bowl of them when they were fresh and tart and loved them. I think it’s just preference thing. I followed this recipe exactly and it came out looking stunning and very impressive however the cake is extremely dense and very heavy and I did not overmix it and the frosting is terribly sweet, sickly sweet. I do not recommend trying this recipe out on guests because it is a cake that I won’t make ever again. Flavor is okay however certainly NOT delicious nor is it memorable. Only positive it looked fabulous and sure wish the taste was good. I’m sorry it didn’t meet your expectations. This is definitely a dense cake, so you probably didn’t do anything wrong, it just might not be your thing. Ikea is a total trap. Those cinnamon rolls smell amazing and you can’t leave without walking by them! This cake looks like it belongs of the set of The Nutcracker. It’s perfection! Ah, the Nutcracker! Love that! Thanks Mir! I was trying to stay away from making any cakes this holiday season but this one totally seems worth the effort! It looks so beautiful AND delicious! Thank you Rachel! I hope you get to try it – definitely worth it! I need the receipe! This looks so gorgeous! Isn’t Ikea the greatest ever! Did you have some of their 1$ Fro-yo? It’s SO GOOD! But, not nearly as good as this cake. GIRLFRIEND, this is STUNNING! I want 10 slices! Pinned! OMG this is gorgeous! This is definitely going to be made for Christmas!! Not only do your creations look wonderful……your photography is stunning as well. What a beautiful blog. It is a truly an unguilty pleasure…..going to try two recipes thos holiday. Thank you. Thank you so much Mariann! I hope you enjoy the recipes – I’d love to know how they turn out! Incredibly beautiful Lindsay! Your photos are always top notch. This cake is a serious stunner, Lindsay! I LOVE Ikea! But it’s so hard to get in and out, especially without eating anything! Their $1 frozen yogurt is really good too! 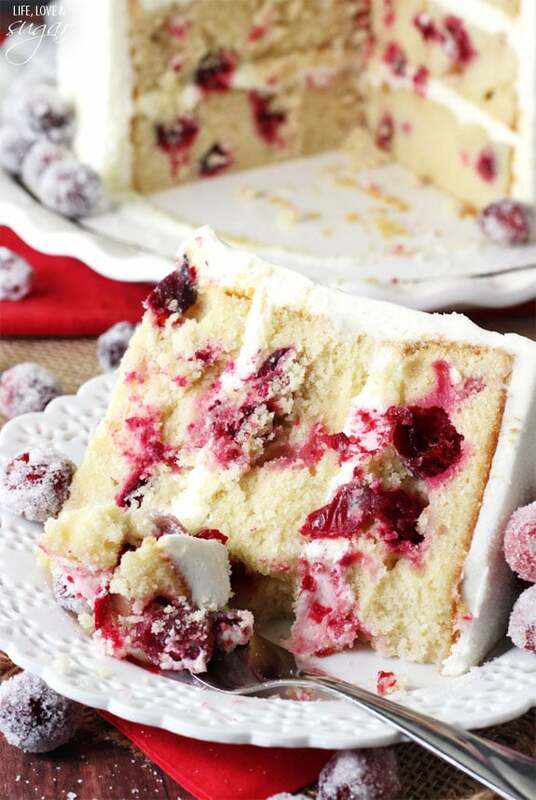 This cake looks incredible — white chocolate and cranberry is one of my favorite combinations! Ohhh, I’ll have to try the frozen yogurt next time. Thanks Ashley! This is just one of the most GORGEOUS cakes I have seen! This is seriously one gorgeous looking cake!! Lindsay, wow, this is simply gorgeous! I’ve been baking with fresh cranberries this year, and why haven’t I done that way before this year?! So, so, good! You did such an amazing job with the icing of this. That white chocolate icing is perfectly done and almost too pretty to eat. But I’d totally eat it. Thanks Amy! 🙂 I’m definitely loving the fresh cranberries now too! 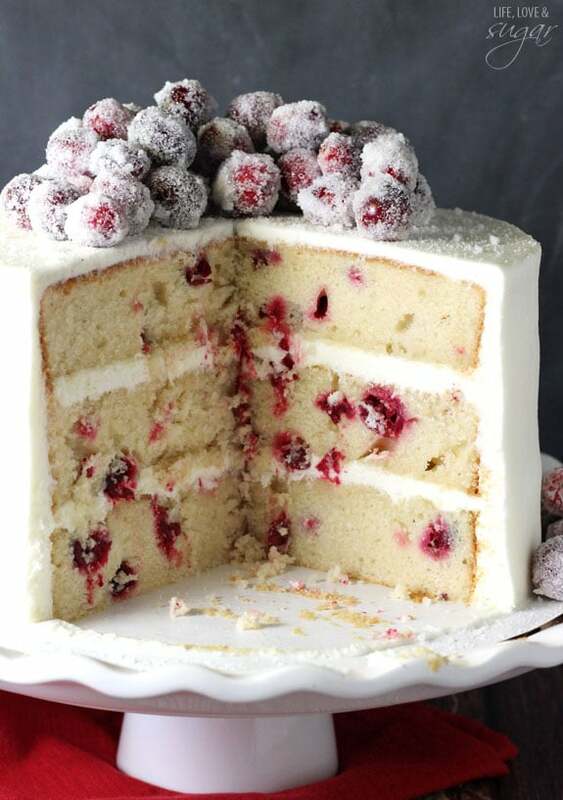 You can definitely cut me a thick slice of this cranberry and white chocolate cake right now – it is ALL I am craving. Pinned! This cake looks so moist and delicious. Absolutely gorgeous!!! This looks absolutely amazing and magical! The cake looks so soft and spongy and your decoration is fantastic! I am glad that you are getting your office space! It’s always nice being able to have your own place to plan and organize! 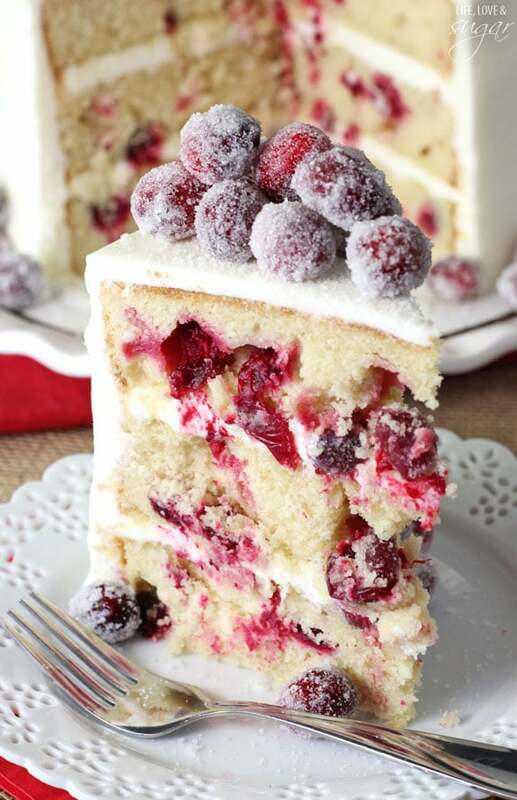 Whoa, I am so in love with this cake and those beautiful sugared cranberries!! Wow what an amazing looking cake – can’t wait to try this. Just a question about the icing – is this an icing you roll or spread. It looks so smooth on the beautiful pictures you have taken. I’ve only been to IKEA once before, but oh my goodness it was overwhelming! We were just looking at bed frames, and it took 10 minutes to get up to the second level and weave around to find them. Then getting back of the store… Man. I needed a cinnamon roll to make up for all those walking calories I burned! 😉 Since we live in CA, we haven’t had a white Christmas either, but I’m surprisingly okay with that. I’m a wimp when it comes to the snow, so I’d much rather have your snowy cake instead! Pinned! First off gorgeous! I’m in the process of making it. 2 tbsp of Vanilla, seems like a whole lot? Was that an accidental typo? Or is that correct? It is correct. You can reduce it though, if you’d like to. This cake looks so delicious, but I cannot trust the ingredient amounts posted. Hi Anne! So sorry about that – thanks for point it out! This recipe is actually a double batch of the base recipe that I use and I forgot to change the gram and ml measurements. Again – so sorry! They should all be double what was shown and I’ve updated the recipe. Thanks!! I love the images on your site and this cake is gorgeous. You have such a fun job! I am by no means a baker but I would like to try this recipe for Christmas. I suspect mine wont be nearly as gorgeous as this but here goes….Thanks for sharing! Merry Christmas! Thanks Rachel! I hope you get a chance to try it! Merry Christmas! Beautiful looking cake. I am making it for Christmas. Does it need to be refirgerated? Since the icing has cream in it I am thinking it does. I will need to make it a day or 2 before. I didn’t refrigerate it, but if you’d be more comfortable doing that because of the cream, you certainly can. This is beautiful!! I waited until the last minute to make for tonight. Hoping the cranberries can sit in my fridge a few hours before baking cake and it will still work??? Also is this cake super sweet? Or does the tartness of the cranberries balance it out? Thanks for sharing! I’m sorry Jennifer, I was a little confused. 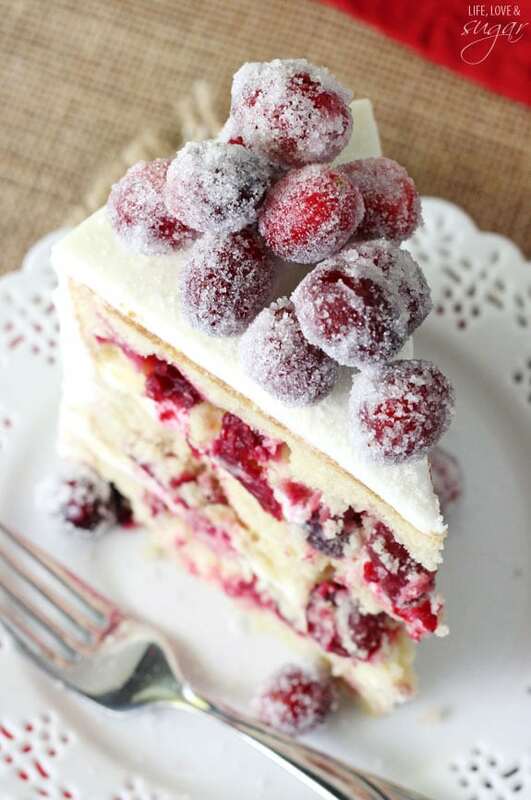 Were you wondering if you could refrigerate the cranberries before using them in the cake? If so, yes, they should be fine. I wouldn’t say the cake is super sweet. The tartness of the cranberries definitely balances it. Enjoy it! Making this tonight, it looks so delicious!!! When you mix the sugar water for the syrup will it be thick? Simmer on low not boiling? Hi Shannon! No, the mixture will not be thick. It’ll be a little syrup-y, but not much. And yes, you don’t want to boil it. I saw this recipe and immediately wanted to make it for Christmas. As someone who has baked for about thirty years it struck me however that it seemed to have a flaw in the directions. It says nothing about using only the egg whites (you get a yellow cake if the whole egg is used) it also seemed like a lot of flour but then I figured the sour cream and milk amounts would thin the batter out. I went ahead and followed the recipe as written. The batter was very very thick and the color was yellow. It was very difficult to spread into the pans. I can live with that but the cake even though distributed into three cake pans didn’t seem to fully bake in the middle due to the density of the batter. The texture of the cake was far too dense and heavy. I suppose it could be made into a fruit cake with brandy infused into it but it came no where near to the what the photo portrayed. I needed to make my standby cake and added the cranberries. As for the frosting. not sure if I’ll try it. It sounds good but I don’t have a back up at this point if it doesn’t turn out…..maybe I’ll give it a try after Christmas. Hi Jeanette. This cake actually uses 3 whole eggs, not egg whites, so no flaw in the instructions in that sense. Did I mention egg whites somewhere that gave you the impression they should be used? I can’t find it myself, but if there’s something that’s confusing, I’d like to fix it. My understanding is that a traditional yellow cake uses mostly or all egg yolks. This is not a yellow cake, but it’s also not a white cake. Just a vanilla cake with cranberries and white chocolate icing. I hope that helps clarify. It is a little denser of a cake – that’s how it’s meant to be. Nope, the ingredients are correct as listed. wow i’m so making it!!! it looks great, i don’t know if i can find any fresh cranberries in istanbul, but what the hell, i’ll sure try!! I was thinking about using a cream cheese frosting. Do you think it would be too heavy or too rich?? I just made this cake for our family Christmas eve dinner. Please note in your recipe that you use salted butter. Most bakers like myself use unsalted butter. This cake needs salt! Also, the recipe for the white chocolate buttercream doesn’t list vanilla extract, but in the instructions, it says to add vanilla with the powdered sugar, how much? My cake turned out beautifully but lacks flavor without the salt. I’m so sorry that the butter ingredients weren’t clear – I’ve added that it should be salted. There actually isn’t any vanilla in the icing, so I’ve removed that from the instructions. Thanks for pointing it out. Merry Christmas! Gorgeous cake! I’m making it for our dessert on Christmas Day. I noticed that the instructions for the frosting say to add in the vanilla extract but I don’t see the amount listed in the ingredients list. How much vanilla should go in the frosting? Thanks! The vanilla is actually not needed in the this recipe, sorry about that. I’ve removed it from the instructions. I hope you enjoy the cake! Merry Christmas! I made this beautiful cake last night, just prepared the cranberries and waiting for them to dry to decorate! I noticed two things about the recipe that I wanted to point out. First thing is in the recipe for the cake it calls for 2 tbsp of vanilla extract, I think that might be a typo. I used 2 tsp and the cake tasted perfect( the domes ;)) . Last thing is when it came to making the frosting in the ingredients there is no mention of vanilla but in the description you say to mix the powder sugar and vanilla in. I ended up leaving it out, would you recommend putting it in? I love the way this cake looks, although I was not great at frosting it! Do you recommend any special method to frost the cake so it will come out as smooth as yours? HI, I am going to make this dessert for my in-laws house for Christmas. Have you ever put white chocolate chips in the batter? How did you avoid lumps in your cake batter? I was always taught to add dry ingredients to wet ones. This clarification is super helpful! I just put my cakes in the oven and was feeling very insecure about the “lumpy” element. Decided to err on the side of “do not overmix” rather than get all those butter lumps out. Dear K- No one ever adds butter to the flour along with the wet ingredients. To beat it enough to get the butter to soften up, the flour would develop so much gluten it would be tough. Butter and sugar should be creamed, then wet ingredients added, then dry. Or butter can be melted and beaten with wet ingredients and sugar, then flour added. Yes, sugar is dry, but you add it in with wet ingredients to reduce mixing time for flour, again, to reduce gluten formation. If you notice, almost all these comments are about how beautiful it LOOKS and how they want to make it, not feedback from people who actually baked it. Sad. Win – you correct as far as mixing goes. As for appearance and taste from those making it, plenty of people have commented on taste who have made it. And what you can’t see in the comment section on the blog is the hundreds of times I’ve been tagged in photos of this cake on Instagram from those who have made it and people definitely love the taste, as well as the appearance. I hope you get a chance to try it. Thanks! I’m so glad you enjoyed it! Thanks Robert! Hi…made this for New Years. The sugared cranberries are awesome, the frosting is great, and overall it was a hit, but my cake was very dense and not at all cakey. I’m guessing I overbeat the batter, but the way the recipe goes even if the butter is soft at the start all the other cold ingredients harden it and it is lumpy so you beat more. Next time I would do the classic butter and sugar first, eggs, then dry ingredients. Hope this helps someone because the overall recipe is great!! Thank you and happy new year! I meant to make the cake for a Christmas party, but hadn’t read the part about soaking the cranberries overnight, so I didn’t have time. Ended up making it for another event. The cake itself was incredible and WILL be made again. I used two 8″ pans instead of 3, but will probably dig out a third one next time. I won’t do the white chocolate or the sparkling cranberries again, though. I’m a cranberry fanatic, and live on cranberry baked oatmeal all winter, but the sparkling cranberries were inedible and the white chocolate, nice as it sounded, didn’t lend anything useful to the cake. I have a tried & true buttercream recipe I’ll use, or maybe even a cream cheese frosting. Hi Juli, I actually have a great tutorial here. We had so much fun making this cake! It looks soo good, can’t wait to slice it on Thanksgiving. This looks amazing, and I’m hoping to make it this year for my family, for Christmas! My mum is allergic to cranberries unfortunately, so I was wondering if the recipe would work the same if I added Raspberries instead? Yes, raspberries should work great. Thanks Annie! Hello, i have just baked this cake, however i am feeling so insecure about it. rather than diving it into 3 different tin, i had all the batter in one….. so after about 3 hours of it in the oven, im still feeling its not completely cooked in the middle….wheni shake it, it wobbles a bit like hard jelly. also i think all the cranberries raise to the top during baking, now the top layer looks a bit too burn, and it has an arch with cracks..
I’m sorry Amy, but I don’t think it’d bake very well all in one pan, which is probably what you noticed. The batter ends up quite thick and by the time the inside bakes, I’d guess the outside is overcooked. I’d try again with it in 3 pans. And yes, I do cut the domes off the top of the cakes so they are flat. Have you thought of using agave nectar and water for the sparkling cranberries then dusting them with sugar? I did that for another recipe I made and they only needed 3 hours chill time instead of an over night because it was a thicker liquid. Then I used that agave nectar blend for making cranberry sauce, nothing wasted. Just a suggestion. I hadn’t thought of that, but what a great suggestion! I’ll have to try that next time. do you think this recipe would be affected if i used gluten-free flour? looks delicious! My guess is yes, but I haven’t used gluten free flour before. Did you try it with the gluten-free flour? If so, what type/brand did you use? I’d love to make it for Christmas, but my father-in-law is gluten-free. Thanks! First let me say the cake pictured is beautiful but…..the cake I made from the recipe was not the same and I don’t know why. I made the cake for a work event but was so disappointed with the extreme density that I decided not to serve it to anyone. It seemed almost undercooked but I know it was not. I plan, though, to try it again with a few modifications of the recipe. 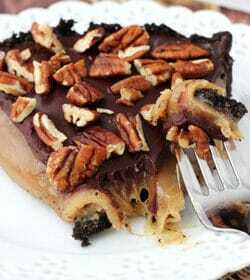 I’m going to try to figure out a dairy free way to make this. I want o make it on Christmas Eve but my mom is allergic to dairy. I’ll keep you posted! I want to make his cake for Christmas this year, you mention to let it settle for at least 24 hours does that mean inside the refrigerator correct? Sorry if that’s a dumb question but I’m knew to baking and is thought I’d give it a shot with this recipe! 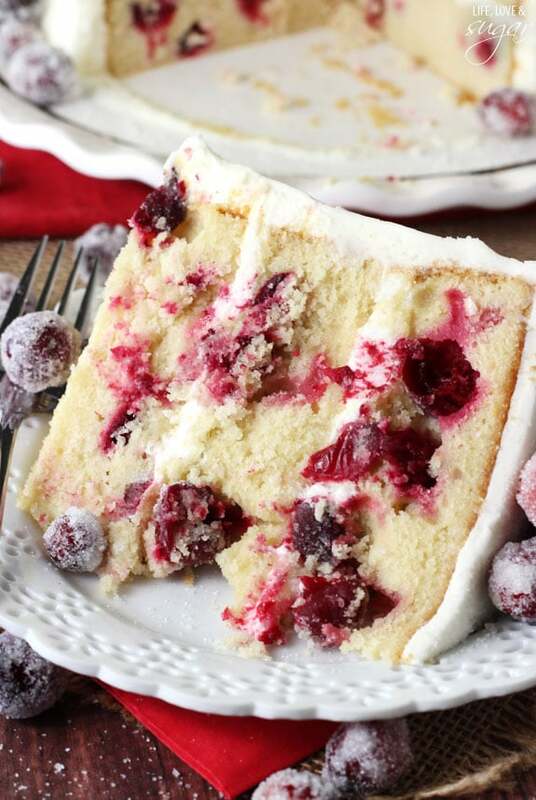 Yes, you’ll want to refrigerate this cake with the cranberries on it. And the 24 hours is certainly not a requirement. I just find that often after frosting a cake, the moisture from the frosting settles into the cake over time and makes it even better. I made this, as written, from beginning to end other than adding Lindt white chocolate truffles on top…it was probably the best non chocolate (dark) dessert I’ve ever made. It was the hit of the Christmas party I took it to, not only because it was gorgeous, but excellent. Dense yes, but so moist. The tartness of the cranberries in the cake perfectly offset the sweetness of the icing, and the sugared cranberries, just yum! I’m making this again for Christmas. Thank you for the inspiration with your gorgeous photography, and a top notch recipe to go with it! I’m so glad you enjoyed it! Thanks Beth! I HAVE A QUESTION ON THE CRANBERRY WHITE CHOCOLATE CAKE. ARE THE 3 CUPS THAT GO INTO THE CAKE PUT INTO THE SUGAR /SYRUP MIXTURE BEFORE ADDING TO THE CAKE OR IS THE SUGAR MIXTURE JUST FOR THE CRANBERRIES ON THE OUTSIDE OF THE CAKE? IF THEY ARE, APPROXIMATELY HOW MUCH OF THE CRANBERRIES DO YOU PUT IN THIS SUGAR MIXTURE? It is specified in the ingredients above. The sugar/syrup mixture doesn’t go into the cake, it’s only for soaking the 2 cups of cranberries that go on top of the cake. An additional 3 cups of cranberries go into the cake itself. I cooked the Sparkling Cranberry White Chocolate Cake (added vanilla to the icing and only used 7 cups of powdered sugar) for a Christmas Party. It was a hit. This is one recipe I will keep. Thank you for sharing it. Can the cake be made and frozen for a couple of days? I’m hoping to bake it several days before Christmas, freeze it, then defrost and bake on the 25th. Thanks! The cake layers should be fine frozen. Does anyone know if I can make this in a 13 x 9 pan? I saw this cake online earlier this week, I love cranberries, and the beautiful photos compelled me to make it for my husbands office Christmas party. I found out the day before that there would be a best dessert award, and so the challenge to win was an additional motivation. I followed the directions exactly and made the cake and iced it the night before. I made the sparkling cranberries the day of the party, and just boiled the simple syrup until most of the water was evaporated. From that point it was very easy to cover the cranberries in the syrup and add the sugar coating. They dried on a sheet of waxed paper within an hour or so. The cake turned out beautiful, and I won the first place award! I had so many kind compliments from friends and coworkers. I forgot to take even one photo, so my husband says that means I’ll have to make it again! Thank you Life Love and Sugar! How did you cut the cake? I’m going to make it for Christmas, but I think it’s going to be difficult to serve such pretty slices like the photos here. I’m thinking each piece may look like a squashed mess. I don’t recall squashing to be a big problem when I cut this. 🙂 I just used a good sharp knife. The cranberries soften a good bit while baking, so while slices might not be perfectly smooth, they should be fine. If it’s a big concern, you could consider refrigerating the cake since that would firm it up and make slicing easier. Keep in mind though that a cold cake tends to be less moist and it’s best to let it sit out for 30 minutes or so before cutting. I made this as cupcakes last year and they were just as gorgeous. Very easy to serve and keep them looking nice. That’s awesome Becky! I’m so glad! Thanks so much for letting me know how much you loved it! Merry Christmas! I just made this cake this weekend for a December birthday. The cake seriously was so delicious and the cranberries are so perfect with this cake. Everyone loved how beautiful it turned out and I did follow the advice of letting the cake sit for a few hours before serving and it definitely made the flavors blend together and the cake was very easy to cut into. Thank you for such a great recipe!! Does the cake need to be refrigerated after completion, when sitting (as you suggested) 12-24 hours? My cranberries are “sparkled” today, drying overnight, and making the cake tomorrow for Christmas Eve. It’d be safe to refrigerate it with the fruit in it. But I’d let it sit at room temperature for 30-45 minutes or so before serving so it’s not too firm. Cake is usually best eaten closer to room temperature. Not sure what I did wrong, cake looked beautiful but it was way too dense and wet. And I actually baked it longer than suggested. Anyone else have this issue? My cake was also very dense. People liked it but I would have preferred a bit fluffier. Saw a comment about blending the butter and sugar first,more traditionally, think that would help? Otherwise, would probably make a good white cake and add cranberries. It was pretty however! Want to try it again. I’m making this now for christmas. Will the cranberries stay frosted so beautifully if I refrigerate until Christmas? They should. You might consider putting the sparkling cranberries in a separate container and then add them on top later, if you just wanted to be safe. I don’t think it’d be an issue, but it’s possible that the moisture from sitting on the cake could effect them. Any idea how this would bake in a bundt pan? I’m thinking of attempting that as I don’t have 3 cake pans on hand and it’s too late in the game to head out to buy more. I really am not sure, as I haven’t tried it in a bundt pan. I’m thinking it might be ok, but I’m not sure if it’s a little too much batter or not. I tried it in the bundt pan and it worked well as far as space. I only oiled the pan, but probably should have floured it, too, because it broke in 2 while trying to get it out of the pan. Completely salvageable though! It was a hit and looked so beautiful! I wish I could share a pic! Hi! Ive never baked with cranberries. I’m going to try to bake this for christmas. I bought a bag of ocean spray fresh cranberries. This may be a silly question but do i need to do anything to them before using in the cake. a friend told me I need to boil cranberries or they would be really hard. But i can’t find anything about boiling them. What do you recommend? I didn’t boil them before adding them to the cake. Just wash them and probably check for stems. Like with blueberries they can sometimes have little stems. When I added the butter in with the wet ingredients it got lumpy from the cold milk and eggs. Would it be better to cream the butter with the sugar first? The butter can be a little lumpy and usually bakes just fine. However, you could lightly melt the butter first so that’s less of an issue. I don’t recommend creaming the butter and sugar first, but some people have said they’ve had success doing it. I haven’t done it myself. Your cake looks so pretty and delicious! Im just wondering did you also have to soak the 3 cups of cranberries that are going into the cake batter? No, I didn’t. I just washed the cranberries before adding them. I made this for Christmas & it was really tasty. There were no “domes” for me to cut. I think the fact that the butter doesn’t incorporate completely prevented it from rising much? The cake is dense, but still tastes great. I was nervous about the frosting having 7-9 cups of powered sugar (in addition to the white chocolate), but made it as stated because I didn’t want it too tart. Most of my frosting recipes call for 3-4 cups powdered sugar, & I’ll do that next time. For me (& about 1/2 my guests), it was just too sweet & that was even without using about 1 1/2 cups of the icing. I think it was also harder to taste the white chocolate with so much sugar as well (I kept tasting it as I added sugar). Overall this was beautiful & perfect for winter. Solid & easy to make & cut ( it holds together well even for travel). 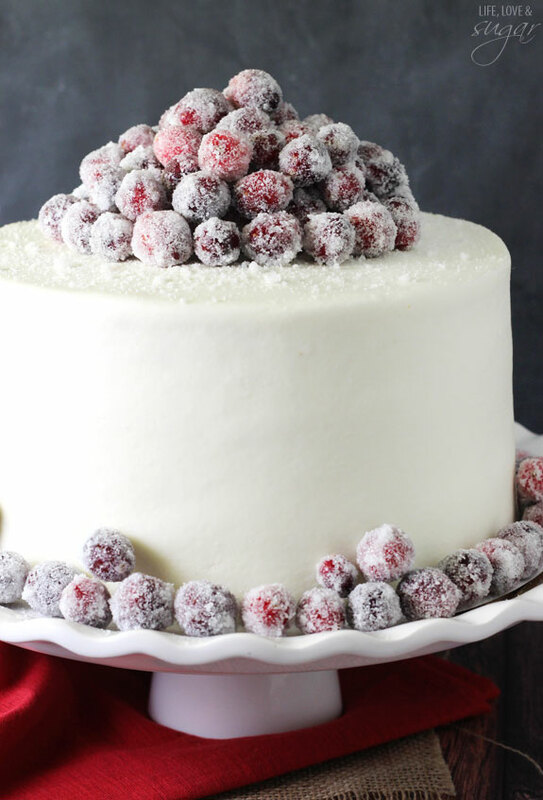 I love sugared cranberries but have never used them on a cake. They are tart, but addictive. People were surprised at first, but kept coming back for more!! I would like to make yours beautiful Christmas white chocolate cranberry cake.but, my problem right now is that I can’t find fresh cranberries ,I guess is out of season now since this is almost February.do you think I could use a frozen cranberries on this cake ricepes ? Thanks. 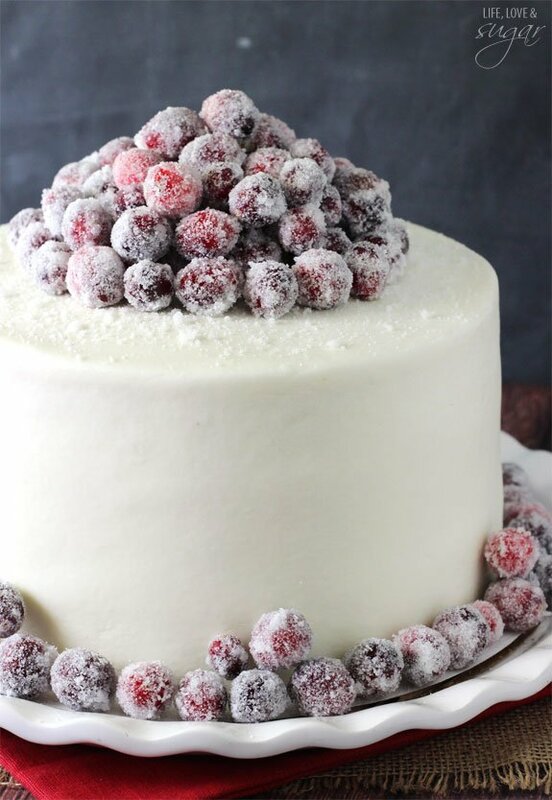 Frozen cranberries should be fine inside the cake, but if they are softer when thawed they may not hold up as well as a decoration on top of the cake. Help! I’m from the Netherlands and my oven doesnt bake that high! (350 degrees) is it diffrent for European messures? Yes, the 350 degrees is in fahrenheit. I believe it’s 176 degrees celcius. hi Friend, here on Greece we dont have fresh cranberries (or blueberry et) what else i cant replace it? Hi you can purchase dried cranberries and rehydrate them. If the recipe calls for 1 cup of fresh you should measure 3/4 cup of dried cranberries and place them in a bowl and pour boiling water over them until they are covered and cover them so the steam is contained so that the cranberries can absorb the water. You can also use hot fruit juice to enhance the flavour of the dried berries and can also add back some of the nutritious value into the berries. After they plump up a bit you can let them sit for a while then add them to the cake. I love sugared cranberries! Not only are they beautiful, but I love the pop of flavor they give you! This cake sounds amazing! I wanted to try your sparkling cranberry white chocolate cake recipe. But unfortunately I couldn’t find any fresh cranberries here. Could you please recommend another fruit for the same recipe. Appreciate your advice. Thanks in advance. I would imagine another type of berry would work fine as a replacement. If you have a specific one you are thinking, feel free to ask about it. It is very hard to get fresh cranberries here in New Zealand. Do you think I could replace them with fresh raspberries? Lovely looking cake, will try it this weekend. My sister is coming over. One question, doesn’t the butter, sour cream and milk/egg mixture curdle once you add them together. Not everything will be the same temperature. I have tried a cake recipe similar to this before, following your same method here it always turns out a big curdled mess. Please give tips! Thanks. I haven’t had that problem, but you can definitely make sure the ingredients are all at room temperature to help avoid that. You just say to mix the dries then go on to mixing wets. Should I put wet ingredients in the dries one by one, or mix them seperately and combine them? Honestly, either way would work fine. This isn’t a super fussy recipe. The way the recipe is written though is to just add it all to the dry ingredients and use one bowl. I tried to make the cranberry cakes were raw in the middle. What went wrong? So hard to say from a distance without seeing everything. Could I make the Cranberry cake in a bundt pan? I haven’t tried it, but I’ve been told that others have and it was a success. I made the cake and it was very good! the taste of the cake itself I loved especially with the tartness of the cranberries. However, it was very crumbly. Im not sure what I did wrong. Also, I only used 2 cups of sugar for the frosting and even that seemed a bit much and overall it was slightly heavy. I really enjoy the flavor of the cake and a bit of sweetness from the icing is a must but I mainly avoid the icing when eating it. I bet this cake is as delicious as it is beautiful. What a fabulous idea! Can I make the icing the night before??? Hi Lindsay! I made this cake for our department’s Christmas party the other night. I am a little annoyed with myself though since I think I over-mixed the batter as the cake turned out a little rubbery. That being said, it still got rave reviews by everyone at the party! By the time the night was done, people had gone back for seconds and were asking me to make their wedding cake! Thank you so much for sharing your delicious cake recipes with us! Have a Merry Christmas! I’m glad everyone enjoyed it! Merry Christmas! 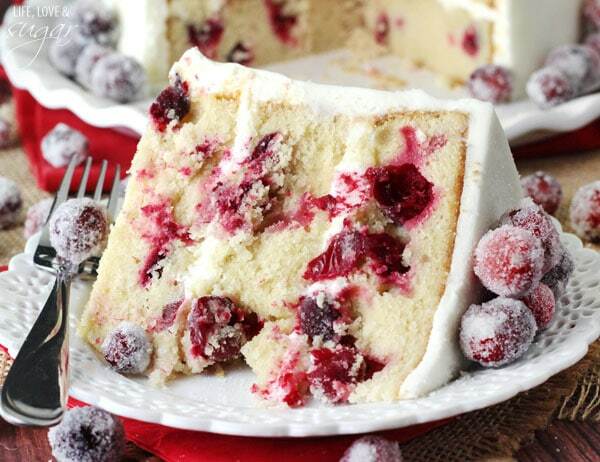 The Sparkling Cranberry White Chocolate Cake is amazing! Took it to a Christmas luncheon and was a HUGE success. Will be making it again! Merry Christmas! How in the world do you get your frosting so smooth that it looks like fondant? Looking at making the Sparkling Cranberry White Chocolate Cake…. Here is my tutorial showing my method. 🙂 I hope you enjoy the cake! First of all this cake is gorgeous so decided to make it but I needed a 6in cake so I did half the recipe, it looked fine to me, soft and bouncy. I wrapped it and refrigerated it, the next day it was really hard i was hoping it would get softer if it was room tempeture but it didn’t, the feedback I got is that it was dry. 🙁 and the icing was too sweet. So i guess I am trying to figure out what was my mistake, the only thing that I could not do exactly half was the eggs, I used 2 instead of 11/2. I’m sorry you had that result. I haven’t made it as a 6inch cake before, so I don’t know if that had something to do with it or not. Another possibility is using a little too much flour. Did you use cups or grams? Sometimes people scoop cups differently – be sure not to pack the flour into the scoop. I typically loosen up the flour, then scoop and level. Hi Lindsay! Absolutely beautiful cake, I’m going to give it a try for Christmas day this year. Just a quick question – how long would the sparking cranberries last once made? I’m caught for time this year so I was hoping to prepare them on the 22nd, would they last until the 25th? I’m planning to ice it Christmas Eve, I completely agree with you that cakes need the 24 hours to set, it really enhances the flavours! The sparkling cranberries will really last as long as the cranberries. They’ll definitely last for a few days to be added to the cake later. Enjoy it! Do I need to adjust baking times when using 9 inch pans? Also how should this be stored when made a day in advance? Thanks! Yes, they’ll be thinner cakes, so a little less time. I’m not sure exactly what it’d be. Maybe 25-30 minutes? Hi Lindsay! I want to make a cranberry white chocolate roll cake/buche de noel for Christmas. Since this recipe is a layer cake, do you think it would be possible for me to use this recipe for a roll cake? Would the cake be too dense? Would it crack a lot since the recipe is not supposed to be made into a roll cake? I haven’t ever made a cake roll, so I don’t know how to advise you on it. I’m sorry! How many people does this serve? Also does this make 3 layers or one layer of an 8 inch cake? It’s 3 layers of cake. I’d say it’ll easily serve 12-14. I made this cake last year and it turned out great. I made it again twice this year and have had trouble. It was dense and raw in the middle. I can not figure out what I did wrong. You suggested melting the butter. Do you think I should melt the butter totally and then add it. If that is the trick I will try a third time. Any help would be appreciated. Hi Deb, I’m sorry you’re having trouble this time. I’m not sure what the issue is, it’s so hard to say without being there and seeing it. It shouldn’t be the butter though. This is a beautiful cake! I couldn’t find fresh cranberries at the store, so would you recommend using blueberries? Would it work with the frosting and cake flavors in your opinion? Thanks! I think it’d still taste good. Blueberries may not work as well with the “sparkling” part though. They aren’t quite as firm. Made this cake for Christmas, 2016, not once, but twice. The first time I had my doubts when I saw the sugar listed with the dry ingredients. Almost every cake I’ve ever baked suggests mixing the butter and the sugar together, but I moved on with the process. The second time, I mixed the sugar with the butter, as I have always done in the past, and then added the rest of the wet ingredients, before adding the dry, with much better results. Both times it resulted in a heavy, dense, cake I feed to the squirrels. The third time I used a recipe of my own for the white cake, then added the cranberries, as you suggested, with excellent results. I had problems with the icing recipe as well. Nine cups of 10X sugar was just too much sweet for me, and it was difficult to pipe. So I cut it back to 3 cups with much better results. I won’t use this recipe again, because I’ve baked cakes for more than 50 years, and just couldn’t find a way to make it work. But what I will take away from the experience if the combination of white cake with fresh cranberries…just lovely. I made this for Christmas and what a perfect holiday cake! It is dense as others say but we didn’t have any problem eating it! When I made the frosting I did not use anywhere near the 8 cups of powdered sugar but my frosting still had a nice consistency. No way could I get it smooth like the picture but it’s still pretty with the white and red contrast. It was an unusual cake and people would say what is this – it’s so different, but it’s good! I made it just like the directions said (outside of the frosting and sugar) so no problems following the recipe. It’s strange to me to not cream butter before putting in the dry ingredients but it worked out. Will definitely make this again! I made this cake (twice) this Christmas and it was AMAZING! Definitely the most involved recipe I’ve ever done and although it was a little time consuming it was not hard. It was 100% worth the effort. It does taste as good as it looks. The icing is sweet but is balanced with the tartness of the cranberries. I am already thinking how I can modify it and use the cake and icing as a base for another cake. Everyone was impressed when they saw it and enjoyed it, it has already been requested by my brother for his upcoming birthday. Thank you! We don´t have fresh cranberries here in Brazil. Do you think it will work with dried cranberries? I was thinking of soaking them in a water and sugar mixture first to rehydrate them. Hmm, not sure. They could end up a bit chewy. I see this is to make an 8 inch cake but how many servings should this cake provide? This is what is really important to me when I see a yield, I want to know how many I can comfortably feed with this. thanks! I would say 12-14 with relatively generous slices. Thinner slices would give you more. 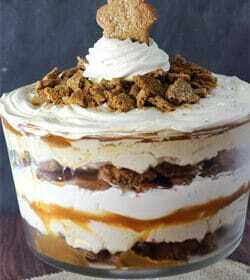 I am going to make this for my aunt’s birthday and I had a question that I didn’t see answered in the other comments. I don’t have 8 inch pans so I was going to double the recipe and make it in 9 inch pans and use the extra batter to make cupcakes. Could you tell me approximately how many inches deep the batter should be in the pans? Can’t wait to eat this! It’s really been quite a while since I made this cake, so I’m not sure just how much batter was in each pan. You wouldn’t really need much more though for 9 inch pans. After reading all the comments this cake seems to be hit or miss with no real middle ground. I arrogantly thought the negative reviews were simply errors in execution. After baking it myself, I fall into the failed execution category. This cake was a total bust for me. I consider myself a pretty competent baker and very precise, but this just did not turn out well for me. Even with weighing all of my ingredients and trying to be careful to avoid over mixing I still came away with an extremely dense, doughy, and odd cake. This was to be a birthday cake for two people but I will have to figure something else out. The icing however is absolutely delicious. I wouldn’t hesitate to make the icing again in the future but I won’t revisit this cake recipe. I’ve not lost faith in this blog for delicious cakes! I just think there is a fine touch or sense of when to stop mixing with this unusual all wet into dry ingredient method that I am unaccustomed to. Keen to make this cake! Any ideas for making it gluten free? I don’t know a ton about gluten free baking. Gluten free flour should be fine. I’m not really sure what else would need to be substituted. I want to try making this next week for my daughter’s birthday, but I’ll be traveling and can only get my hands on 9-inch pans (similar to the comment above). Do you think I could just use the recipe “as is” in the 9-inch pans? The layers would be slightly thinner and I’m guessing it might cook faster, but do you think it would still be ok? You are spot on that the cakes will be thinner and bake less time, but otherwise it should bake up and be fine. I always make extra cranberries. She and her friends eat them like candy! Wonderful! Glad to hear it’s a well-loved tradition! 🙂 Thanks Nicole! Oh snap! That made us all drool here at work, lol. We are looking for a dessert for our holiday potluck & this is “SO IT! ” – Yumm – the ladies are all super excited to try this! Hello, I plan to make this cake for Christmas. We will be out of town until Decemeber 24th and I want it on the 25th. I tried to read the comments to see if you’ve answered this but I couldn’t find it. I am wondering if I can make the cake and bake it beforehand (today the 19th or tomorrow the 20th) and freeze the layers. Then on Christmas Eve pull out the layers to let them thaw- make the berries and icing and finish it up and let it sit overnight for Christmas. How do you think this would turn out? Has anyone tried to freeze the cake layers just for a few days?! Freezing the layers should be fine. Just wrap them well and thaw them in the fridge. Hi, I have decided to make this for Christmas and was wondering if starting the cranberries today would be okay.? They should be fine made early. Does the Milk have to be whole milk or can we use skim? The cranberries used in the cake are whole and right from the bag, yes. I typically use 2% milk. Skim milk would probably be ok. I thought this cake looked beautiful for our Christmas family party, so I made it. Unfortunately, this cake was extremely heavy and the icing very sweet. I followed the recipe to the tee, and was even hesitant about the amount of confectioner’s sugar to use, but followed the directions as posted. It looked elegant but I wouldn’t make it again. No one finished their slice. how do you possibly get the mix smooth if you are not mixing the butter and sugar together first? I followed your direction and ended up with a liquid mixture with chunks of butter – after cutting butter into pats first. I made this cake for my sit down Christmas dinner party. It was fantastic! I especially loved the white chocolate frosting. My guests were gaga over the presentation and the taste. Spectacular recipe! Thank you. Wonderful! So glad you were happy with it! I have made this cake twice and each time it doesn’t rise. what am I doing wrong? I follow the recipe exactly as written. HELP! the cake is still delicious. I’m really not sure. It’s so hard to say from a distance what would cause the problem. I’m sorry! I was searching for something different for Vday this year….. this is the one. Love it. Thank you for sharing. Should I make any modifications for altitude? I’m at 5200 feet. I want to first say thank you for this recipe! I have made this cake two years in a row, for both sides of my family, and it is a huge hit! This year we are going to a larger party so I was thinking of making it into a sheet cake rather than the double layer. Do you think it will hold the moistness as well if it doesn’t have a middle layer of frosting? I’m so glad it’s been a hit! Do you mean a 9×13 sheet cake? I would think it would stay moist just fine. You probably won’t need to use as much frosting though. I haven’t made this….but will in the next few weeks. 5-stars are for the simple elegant look of the cake. I think when I make it, i will go with the “naked cake” look. Made this for our office Christmas party and it was not only stunning but so delicious! I just had a sliver with my morning coffee and I realize I will need to give the rest of this cake away so I personally don’t eat it all! The icing is addictive and the cake was more like a pound cake, so moist. I had quite a few left over sparkling cranberries but we put a few in a glass of Prosecco! Thanks for the recipe! How did you get the frosting so smooth? I ended up adding 7 cups of powdered sugar and I still think that was on the edge of too much because it made the frosting super stiff, still delicious, but I ended up with a more rustic look than the polished one in your photo! I usually use fairly stiff frosting, but you can definitely reduce the powdered sugar if you prefer. When you ask how I got it so smooth do you mean that your frosting was lumpy, or are you referring to the smooth sides of the cake. If referring to the smooth sides of the cake, check out my tutorial for frosting a smooth cake here. I hope that helps! I’m so glad you enjoyed it! I think you’re thinking is right – mini cupcakes might be tough. p.s.- I made it work! the mini cupcakes were a huge hit at my work party! the recipe makes a lot, so I made one little 6″ cake and over 50 mini cupcakes! I’d like to make this cake for Christmas Eve . Do you have to cook the cranberries first? No, they don’t need to be cooked before adding to the cake. Hi, I made this about two years ago and really liked it! This year I’m considering making it as cupcakes. Can you suggest a baking time? Can I use 3 nine inch pans instead of 8 inch ? Sure! They’ll be thinner cakes, so I recommend cooking for a little less time. I’m not sure exactly what it’d be…maybe 25-30 minutes? Loved this recipe and had so much fun making it for our Ladies get together! So glad to hear it! Thanks Kami! I made this today for our Christmas eve lunch with family tomorrow. The recipe turned out great – the perfect amount of sweetness and stores well at room temp. I followed it to a T, but I added 2 Tbs orange zest and substituted 2 Tbs orange juice for 2 Tbs of the milk. It was the perfect amount of citrus flavor. Thanks for such a well-documented recipe. This one is definitely a keeper. I’m so glad you enjoyed it! Merry Christmas! Hi Lindsay, can I add dried cranberries instead? I’m trying to keep the cost low bcs fresh/frozen cranberries are expensive here and difficult to come by. Thanks! Hmm, I haven’t tried so I’m not sure. They could end up a bit chewy. I saw this gorgeous cake recipe 3 years ago and requested it for my birthday cake (January 3rd). My daughter abliged and it was every bit as good as it looks in the pictures!! So, now I an blessed with her making this for my birthday cake ever since!!! Just had it again 2 days ago – and we all LOVE LOVE LOVE this cake!!!!! That’s wonderful! Happy birthday and I’m so glad you enjoyed! Hi, is the temperature of the oven Celsius or Fahrenheit, ( am guessing F right ? ), also what can i use instead of sour cream ? Fahrenheit. I haven’t tried, but I’ve heard people use yogurt. I love, love, love this recipe! I have been making it for several years and it always turns out perfectly! For an upcoming event I would like to make it as individual cupcakes. You mentioned the recipe was developed from a cupcake recipe. Can you suggest any changes I need to make? How long and a what tempature would you bake them? I’m so glad you enjoyed the cake! Here is the recipe for the Sparkling Cranberry White Chocolate Cupcakes. My daughter made your cake and everyone at work raved about it!! She wants to use your frosting on another cake but it needs to be purple. Have you ever colored it? If so what did you use and at what point did you add the color? I’m so glad everyone enjoyed the cake! I typically use a gel icing color and add at the end so I can get the color to my liking. I hope that is helpful. I really loved this cake. I was just wondering: have you tried using cake flour for this recipe instead of all-purpose? I wanted to experiment with a lighter texture. Do you think this conversion would work? I’m glad you enjoyed it! I’m not sure about cake flour. I haven’t tried it with this cake. Is there any way to make this cake more Keto? Will stevia or swerve work in place of sugar. And is there a flour that is keto that will rise? I’m sorry, I haven’t tried any of those substitutions to know how it will affect the recipe and I’m not very familiar with Keto options.